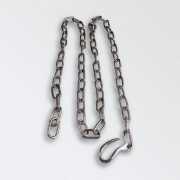 Chains for Cart harness and ploughing. 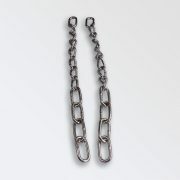 I can have chains made to any size required. Hame Fittings. 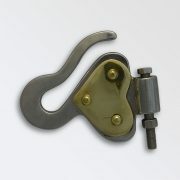 Breeching and hame plates and Joiners. 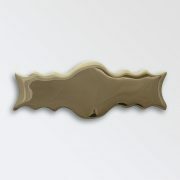 standard 8 ft 6 inch length but can be made to any length. 21” but can be made to any length. 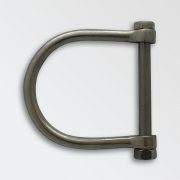 two swivels 56” standard length but we can make to any length. 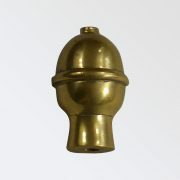 3 “ and 3 ½” standard stock but we can make these to any size required. To fit 3” wide breeching. 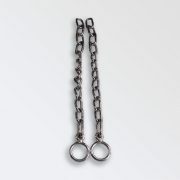 Hold the chains together when showing In hand Harness Class. The Back Band hooks onto the top, breeching and tugs go on the two other hooks and the Belly Band go through the bottom loop which is 3” wide. Walsall Clip on either end. 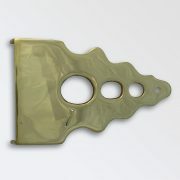 17” from tip to tip but we can make these any length required. 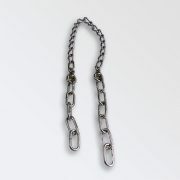 Safety chains are to help prevent the chains dropping to the floor if they accidentally come off the Shaft Staples or Joiner Hooks. Can be made with or without Hearts. 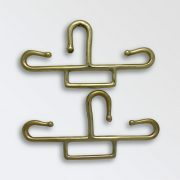 Can be made with a Nail, Thread In or Thread Out depending on your hame fittings. 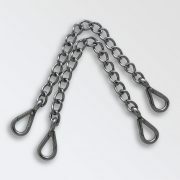 We can also supply Bottom Chains for Hames, made to order in stainless steel.